Multiple dose injection (MDI) therapy, also known as multiple daily injections, is an alternative term for the basal/bolus regime of injecting insulin. The therapy involves injecting a long acting insulin once or twice daily as a background (basal) dose and having further injections of rapid acting insulin at each meal time. Multiple daily injection therapy will usually involve at least four injections a day. What is a non-MDI regime? Before analogue insulins, insulin injections would commonly be given twice daily. The injections would often include a mixture of short acting and intermediate acting insulins. Injections would usually be administered once in the morning, before breakfast, and once before the evening meal; therefore dividing the day into two periods of roughly 12 hours. This meant that once you’d injected a dose, the balance of carbohydrates and activity you take over the next 12 hours would need to correspond to the last dose you injected. 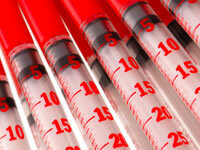 What are the benefits of multiple dose insulin therapy? On multiple daily injections, there is more freedom as you don’t need to plan so far in advance or be so restricted by injections delivered a number of hours ago. Because MDI involves rapid acting insulin, it has allowed people to wait less time before eating after injecting. Depending on the overall GI content of a meal, some people may be able to inject during or after a meal, without their blood sugar ‘spiking’ too much. Generally speaking, rapid acting insulin helps to reduce the effect of high blood sugar levels 1-2 hours after eating. Furthermore a multiple dose regime allows more flexibility as to when meals can be taken. The speed of action of rapid acting insulin also allows people to make correction doses, should they need to. A correction dose is a dose that is given between meals if one’s blood sugar has risen too high. Correction doses are best left to those who are confident with adjusting their insulin as correction dose errors can lead to hypoglycemia. What are the disadvantages of multiple daily injections? Multiple daily injections should be accompanied by a strong understanding of how the regime works particularly as rapid acting insulin can lead to faster onset of hypos if dosing errors are made. A potential disadvantage of the extra freedom allowed by multiple daily injections can lead to more chances being taken, such as eating types or quantities of foods that one wouldn’t eat on a twice daily regime. Who can benefit from a multiple daily injections regime? The multiple daily injections regime is well suited to adults, as the regime offers the flexibility which is sometimes needed. Teenagers who are confidence with the idea of adjusting their own insulin may also find benefits. Pre-teenage children may benefit if parents are confident with insulin dose adjustment and can make time to administer doses before each meal or ensure that their child’s school can. Multiple daily injections may not be advisable for those who are not confident in adjusting insulin, such as with children, older people or those who may find the regularity of decisions about dosing difficult to manage on a daily basis. For some people, such as children and older people, the reduced flexibility of a twice daily regime may actually confer some advantages. For instance, the lack of flexibility may help to reinforce eating the right quantities of the right food and at regular times.